In December 2015, I’d had enough. I’m a writer, but most months my writing doesn’t pay the bills. I live in Southeast Asia and, for years, my day job has been teaching English, phonics and reading. When I first came to this part of the world, a college degree wasn’t necessary to get a decent job – what was important was native English-speaking ability, experience, professionalism and training. Things changed. While many employers were willing to hire me, they couldn’t, because laws had been put into place making it difficult or impossible to obtain a work permit for a prospective employee who did not have a bachelor’s degree. Rather than work “under the table” (illegally), I decided I was going to finally – somehow – get my degree. There were serious obstacles to overcome. Money was a really, really big one. Time was another. Being in Southeast Asia rather than the U.S. was a third. All these things had kept me from getting a degree in the first place. But as they say, necessity is the mother of invention. Or at least some extremely tenacious Google searching. Eventually, I stumbled on the idea of testing out of college courses. I had taken CLEP tests when I served in the Army, so it wasn’t a completely foreign idea to me, but I had no idea that you could do so for all but 3 to 6 of the 120 credits required to earn a bachelor’s. Most people don’t know it’s possible to test out of (most of) a degree. That’s probably because there are only three regionally accredited schools that will let you do it (regional accreditation is the highest form of accreditation in the U.S.). Those three schools are Thomas Edison State University (TESU), Charter Oak State College and Excelsior College, collectively known to people seeking to ‘hack’ a degree as the Big 3. When I found out about the Big 3, I got really, really excited. I knew at that point that what I wanted to do was at least theoretically possible. I didn’t have enough money or time to attend a university for four years, but one or two classes? That was not beyond my reach – especially since the classes I would need to complete were available online. But there was another big piece that was still missing. Sure, it was possible to test out of courses, but where was I going to take those tests? Who was offering them? The answer, fortunately, was that there are lots of ‘alternative credit providers’ out there and most of them are online. Alternative credit providers (let’s call them ACPs for short) can be either nonprofit or for-profit entities whose offerings have been evaluated by the American Council on Education and have been judged equivalent to a course of study at a college or university. Colleges and universities are not obliged to accept such credits, but most take at least some, and the Big 3 take nearly all of these ACE-approved credits. It works like this: you take courses or tests with ACPs and open a free account with ACE. You have the ACPs send your scores to ACE, and, when you’re ready, you have ACE send your aggregated transcript to the school(s) of your choice. Opening an account with ACE is free, the first transcript you send to a university is $20 and any subsequent transcript is $15. I now had the two pieces of the puzzle that I needed. It could be done. Yes, I could get a degree, despite my finances, my time constraints and my location. I chose TESU to be my future alma mater and got to work. Testing out of a degree means knowing what the requirements of the degree are and then finding the alternative credits the school will accept to satisfy those requirements. While I initially felt like a pioneering explorer, I quickly got lost in that particular academic jungle. Luckily, I learned that others had gone before me in this quest to get a degree as quickly and inexpensively as possible. Their knowledge is shared freely at a very special (to me, at least) place called degreeforum.net. Without that resource, I would have made mistakes that definitely would have cost me time and, likely, money that I could not afford to waste. To make an 18-month-long story short, I started knocking out tests at ACPs like Saylor.org, Study.com and Shmoop.com*. The monetary savings was incredible: as an example, Saylor.org gives all their course material free. All you have to pay for is an online proctor to watch you while you take the exam, which costs $25 (and Saylor doesn’t get any of that money – it’s a truly wonderful organization). Shmoop.com offers a monthly subscription rate of around $88 and allows you to take as many courses/exams as you are able to in that time frame. Study.com charges $200 per month and allows you to take two exams per month. The average cost of 1 undergraduate college credit hour in the U.S. is $594 (as of Feb. 1, 2017). Most classes are worth 3-credit hours, so that totals up to $1,782 for one class. The most I ever paid to test out of a course was $114. The least I ever paid was $0.00. That’s how my degree cost me less than $5,000. But the savings and advantages ACPs offer are not only monetary. The ability to study at your own pace means you can graduate sooner. It took me approximately 18 months of studying to complete the requirements for my degree, working full time for most of that period. There are dozens of people who have finished in six months. I know of at least two credible stories of people finishing in four months. And, while it is no longer possible, a man named Lawrie Miller claims to have completed his Bachelor of Arts degree in four weeks. This is not to say that earning these alternative credits was a breeze. I had to study for every single one. Many of the online courses were just that – courses, with unit tests and quizzes that had to be passed. For my oral communication course, I had to prepare and record three speeches. It was not a walk in the park. There is a reason these courses have been evaluated by ACE as equivalent to a college course. But the important thing, besides the small price tag, was that I was able to complete all of them at my own pace. I was not tied down to course schedules. I could push hard when I had free time or walk away from them when real life intruded. The final, critical advantage that ACPs (and my university) gave me was the ability to earn college credit in my own space. I studied and passed courses in Vietnam, in Singapore and in Cambodia. I studied in my kitchen, in a tuk-tuk, in hotel rooms, on busses – anywhere. I never had to step into a classroom. Distance education makes it possible for anyone, anywhere to receive an education. An ‘online degree’ is just a degree, plain and simple, and many other regionally accredited schools increasingly offer distance education options. So, yeah, I did it. I decided I was going to get a Bachelor of Arts degree in Liberal Studies with a concentration in Humanities (say that three times fast) from TESU. I learned what the course requirements were and, with the help of the treasure trove of information at degreeforum.net, I figured out what alternative credits were acceptable. I took those alternative tests and courses from ACE-approved alternative credit providers, knocking them out one by one until only TESU’s Capstone course was left. I took it, and, although it was difficult, I scored a 98 percent (yes, I’m proud of that). It took me 18 months. 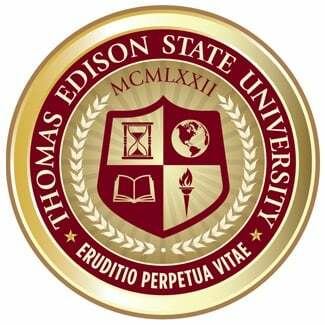 *Update as of May 2018: The acceptance of Shmoop courses for credit at Thomas Edison State University is indefinitely suspended pending further review. Michael McClung is a freelance writer and novelist living in Southeast Asia. His first novel was published by Random House in 2003. His first higher education degree was conferred on him by Thomas Edison State University in 2017.